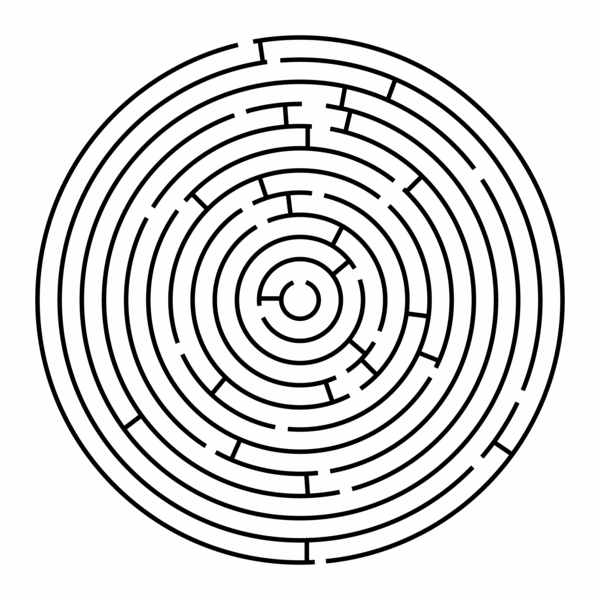 Another name for maze is labyrinth. A maze or a labyrinth is kind of like a puzzle. 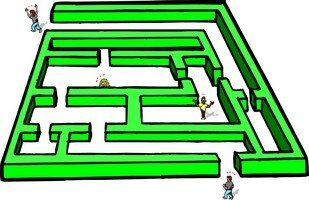 You must find your way from the beginning of the maze to the end. Maybe you’ve had the opportunity to go through a corn maze. Another common maze is where hedges are grown in rows and columns that intersect with each other in such a way to create a maze. When you enter the hedge rows, you would follow the hallways created by the plantings and must find your way to the end of the maze, all the while running into dead ends where the hedges won't permit you to go any farther. After running into this dead end, your only choice is to turn around and go back till you find the correct hallway to enter and try again. It can be quite confusing. That's why I prefer to do my mazes on paper, such as the one here. If you ever get a chance, it might be a lot of fun to see if your town has a corn maze. As you walk through the corn maze there is generally a person sitting high up on a tower watching your progress and they can direct your way if you think you’re lost. Sometimes they even give a prize for the fastest person through the maze. It's alot of fun.